Cheap set of wheels for winter use. Akron/Canton area in northeast Ohio. They are nice but not pristine. Steel wheels (4 of them); 15 x 6.0 with 5 bolt-holes on 114.3mm circle. We've used them on 2007 & 2013 Civics. I think Civic started this bolt pattern in 2006, and still use it now. They do not have TPMS sensors. 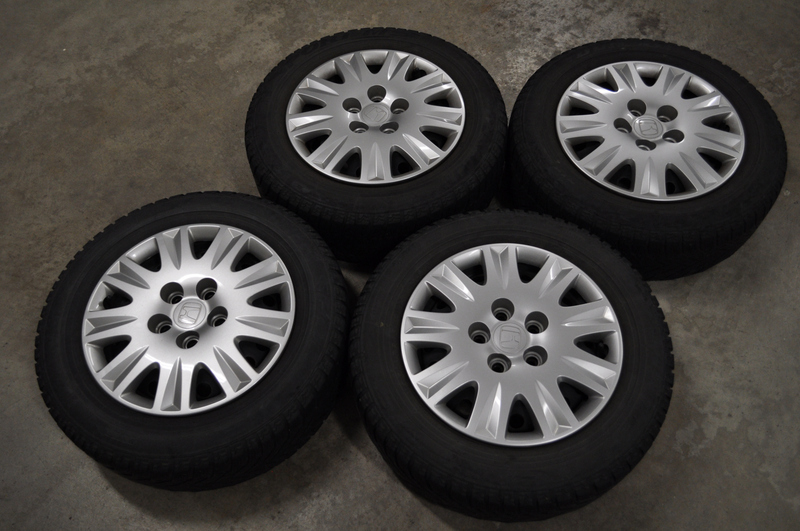 Includes 4 plastic wheel covers from 2007 Civic. 195/65-R15 snow tires which are ALMOST WORN OUT and probably useless for snow. $20. or best offer. YOU PAY FOR SHIPPING - or meet me somewhere near the Akron/Canton Ohio area. Shipping will probably cost more than the wheels, so it's best to meet me somewhere. My daughter moved to Alabama & doesn't need her winter tires down there. Last edited by JimBlake; 11-25-2015 at 05:40 AM. where to buy like these bolt head covers/caps?